They Put A Newborn Puppy With a bunch of Kittens. When Mama Cat sees The Intruder? Her Reaction… PRICELESS! I’d like to briefly talk about why we adore seeing puppies raised by cats and vice versa. 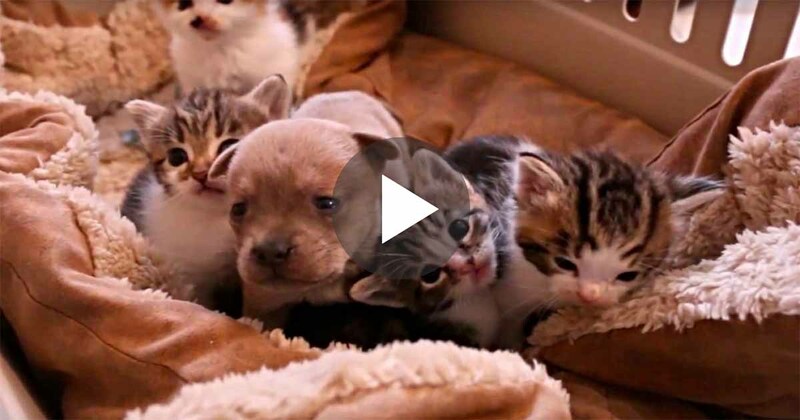 In the video below you can see a light brown puppy among a litter of kittens being raised by a tabby cat. The puppy was just a couple of days old when his mother was killed by a car. It happened in Detroit. The puppy’s name is Bobby and he is a Chihuahua. The video explains what happened. Bobby had to be placed with somebody to nurse and raise him and the available mother happened to be a cat named Gwen. Bobby fitted in very nicely thank you very much. You can see in the photograph below that he is very much at home nuzzling up to his new mother and in the video you can see him messing around with his siblings. Since the video was created Bobby has grown and his five weeks of age. He has been transferred to the Michigan Humane Society from a rescue group that did not have the resources. I believe that the reason why we find these videos and photographs so endearing is because they reveal to us something that we crave and which we fail at, namely, getting along with people of other cultures and ideas satisfactorily so that we live harmoniously with them. In this instance we have two species, dog and cat, getting along extremely well and yet humans, who are one species, too often cannot get along with people of a different culture or religion. It is a human failing born out of blindness, arrogance and self-interest. I think we crave after what we find very hard to achieve which is the acceptance of others and their own personal thoughts and ideas and then to respect the views and opinions of others even if we disagree strongly with them. P.S. Obviously the acceptance of the behavior of others is something else if the behavior is morally repugnant as measured by world opinion. This kind mama need a big hug! —Share this beautiful moment with your friends and family.